Assam’s GDP at current prices during 2015-16 was USD 30.72 billion (approx. USD 985 per capita) and grew at 9 percent CAGR from 2004-05 to 2015-16. During this period, the state’s tertiary sector grew at a CAGR of 15.07 percent driven by trade, hotels, real estate, finance, insurance, transport, communications and other services. The primary sector grew at a CAGR of 11.62 per cent, while the secondary sector grew at 10.31 percent during the same period. 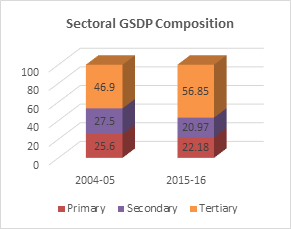 Assam aims to maintain an overall GSDP growth rate of over 10 per cent, with industrial growth at over 9 percent and growth in services at over 13 percent over the next 5 years. Assam is the single largest tea producing region globally and contributes to over 50 per cent (6,31,220 MT Jan – Dec 2015) of India’s total tea production (1.2 MMT Jan – Dec 2015). The state houses over 765 tea gardens across Tinsukia, Dibrugarh, Sibsagar, Jorhat, Golaghat, Nagaon and Sonitpur. The Guwahati Tea Auction Centre (GTAC) is among the largest CTC tea auction centres of the world. The government has secured a Geographical Indication (GI) for the tea produced in the state. As a result ‘Assam Tea’ is known as ‘Assam Orthodox Tea’. Coal mined from Assam has high sulphur content and is mainly utilised by local railways, hydro power stations and steamers. Coal occurs mainly in the upper Assam districts of Tinsukia and Dibrugarh in the Makum and Dilli – Jeypore coalfields. Small coal deposits occur sporadically in the central Assam districts of Karbi Anglong and North Cachar Hills. The proven reserve of coal in this belt is about 340 million tonnes. Good quality cement-grade limestone is found in central Assam districts of North Cachar Hills and Karbi Anglong, where a total reserve of about 670 million tonnes is available. The China clay of Karbi- Anglong district is a vital input for the ceramic industries. The state is the third-largest producer of petroleum and natural gas in the country. Major refineries in the State are located at Digboi, Guwahati, Bongaigaon and Numaligarh with a total refining capacity of 7.00 MMTPA. The Upper Assam & Assam-Arakan Basin in Northeast India is an important oil-producing region and contains more than 18% of the country’s hydrocarbon resource. Assam has over 1.6 billion tonnes of crude oil and 158.57 billion cubic meter of natural gas reserves. Assam enjoys global monopoly in terms of Muga or golden silk production. The state accounts for around 95% of global Muga production. Moreover, Assam is the country’s major Eri silk producer (accounts for 65% of the country’s Eri silk production). Raw silk production in the state during 2015-16 was recorded to be 3,325 MT whereas during 2016-17 (up to May 2016), raw silk production in the state stood at 1,137 MT. Seneh Jori, an Assam Silk Outreach Mission, aims to produce 1 million kg of Muga silk and 10 million kg of Eri Silk by 2025. Assam has a huge untapped potential for agro and food processing industries. The total production of horticulture crops in 2014-15 stood at 7,568.1 thousand metric tonnes (MT). In 2015-16, the total production of rice was recorded to be 5,123 thousand MT. Similarly, the production of pulses and oilseeds reached 195 thousand MT and 13 thousand MT during 2015-16, respectively. Pineapple, banana, cauliflower, broccoli, rose and bougainvillea are among high yielding varieties of horticulture crops in Assam, besides traditional fruits like Carambola, Leteku, Paniyal Thekera, Au tenga etc. Assam houses 300 types of medicinal herbs and plants, with the Brahmaputra valley alone having 150 varieties of herbs and plants of commercial value. An estimated 5-10% of the plants and herbs have been commercially exploited, offering a vast potential for further investments. Since the NER has the highest concentration of bamboo, which accounts for around 60.0% of the total bamboo of the country, Assam has ample scope for bamboo-based industries such as paper manufacturing. The objective of the Government of Assam is to promote bamboo as a substitute for wood and make it the timber of the 21st century. Assam has rich forests covering nearly a third of its land area. The forests in the state act as a reserve for commercially useful products such as timber, bamboo, stone and cane. Assam received 24,720 foreign tourists in 2015, ranking 24th among India’s states. In order to boost the state’s tourism and hospitality sector, the state government has brought out a draft Tourism Policy 2016. Assam offers six diverse tourist circuits, besides several opportunities in niche tourism activities, such as wildlife and ecotourism, spiritual tourism, adventure tourism, wellness and medical tourism, festival and cultural tourism, etc. The state is amongst the most socio-culturally diverse regions in India, which has cultivated several traditional fine and performing art forms. The state is rich in folk music; different styles include regional folk music, ethnic folk music and bihu songs, amongst others. There are diversified important traditional festivals in Assam. Bihu is the most significant and is commonly celebrated all over Assam. The state also has a rich tradition of performing arts. Ankiya Nat (Onkeeya Naat) is a traditional dance-drama (bhaona) form, popular since the 15th century AD. The Bihu dance, Kushan Nritya, Sattriya and Banjar Kekan are some of the popular dance forms of Assam. The culture has a variety of traditional musical instruments including several types of drums, string instruments, flutes, cymbals, and pipes. The Assam State Museum is one of the biggest multi-purpose museums in the country. Instituted in 1940, the museum has some of the most authentic prehistoric sculptures, metal, ivory paintings, woodwork and costumes. The museum has organised several cultural events and reflects the legacy of the entire Northeast region. Guwahati is the major centre for sporting facilities. The sports infrastructure in the city includes the Nehru Stadium and the Kanaklata Indoor Stadium. Additional sports infrastructure has been constructed in the city, especially for the 33rd National Games. This includes a large stadium at Sarusajai (Indira Gandhi Athletic Stadium), the Dr Zakir Hussain Aquatic Complex and the Karmabir Nabin Chandra Bordoloi AC Indoor Hall. Other new sports structures in the city include the Maulana Md. Tayabullah Hockey Stadium, the Deshbhakta Tarun Ram Phookan Indoor Stadium, The Rajiv Gandhi Indoor Stadium in Amingaon and the Chachal Tennis Complex in Guwahati. The city has been selected for hosting FIFA U-17 World Cup India, 2017, the fifth Indian city after Kochi, Navi Mumbai, Goa and New Delhi to be ratified as a venue for the games. Assam has a thriving network of educational institutions, totalling to 53,744 schools and several reputed higher education and research institutes. The state has nine universities including Central & Private Sector Universities, one specialized Agriculture University including one Open University. 590 colleges offer courses at graduate level for studies in arts, science, commerce, lawand classical languages, both Indic and global. There are five medical colleges, one Ayurveda college, two veterinary colleges, one college of aquaculture, one regional dental college, three Homeopathy colleges and one nursing college in the Government sector. With regard to technical education, the state has one Indian Institute of Technology (IIT), one Indian Institute of Information Technology (IIIT) , 13 engineering colleges / universities (public & private sector including NIT) offering 21 graduate courses with an intake capacity of 3,737 students per annum. The State has eight polytechnics and twenty three industrial training institutes (ITI). These institutes offer specialization options in various disciplines. In addition, Central Institute of Plastic Engineering & Technology (CIPET) & National Tool Room offers diploma and certificate courses. Apace Imaging & Diagnostic Centre Pvt. Ltd.